Posted on 10, April 2018 by EuropaWire PR Editors | This entry was posted in Energy, Gas & Oil, Germany, Industrial, Technology and tagged CHINA, engines, Guangxi Yuchai Machinery, MTU Series 4000 engines, MTU Yuchai Power, Rolls-Royce Power Systems, Yan Ping, Yulin. Bookmark the permalink. Friedrichshafen, Germany/Yulin, China, 10-Apr-2018 — /EuropaWire/ — MTU Yuchai Power, a joint venture set up between Rolls-Royce Power Systems and the Chinese diesel engine manufacturer Guangxi Yuchai Machinery Company, is preparing for the start of series production of MTU Series 4000 engines. 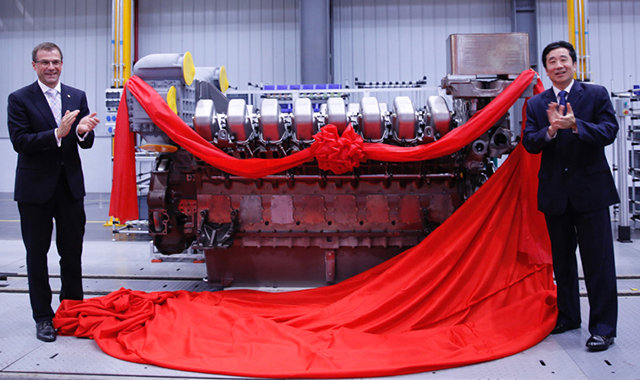 On 9 April, in the presence of over 100 guests, Yan Ping, Chairman of Guangxi Yuchai Machinery Company, together with Andreas Schell, President of the Rolls-Royce Power Systems business unit, unveiled the first MTU Series 4000 engine manufactured in Yulin. Preparations for the completion of the assembly lines for high-volume series production are in full swing, with the large test bench required for engines with power outputs of up to 3,500 kW and as many as 20 cylinders currently being calibrated. Ever since the joint venture received all the necessary regulatory approvals in 2017, preparations for the start of production have been in full swing – modifications to an existing production building in Yulin in southern China have been completed, production facilities installed and logistics and quality processes agreed on. Members of the workforce from Yuchai with the required experience have completed training in MTU engine production in Friedrichshafen that will enable them to fulfil their future responsibilities. In future, they will manufacture MTU engines in Yulin in accordance with the same quality standards that apply in Germany and the USA. “With the MTU Series 4000 engine, we have precisely the kind of product the market in China requires,” said Rolls-Royce Power Systems President Andreas Schell. The constant increase in the demand for energy in China and the neighbouring countries, in addition to the strong demand for energy resources have created a market for power generation facilities and for the oil and gas industry. “The first engine manufactured in Yulin,” said Schell, “is an expression of the excellent working relationship and commitment of the joint teams. We are delighted that, in Guangxi Yuchai Machinery Company, we have found a partner that meets our needs precisely,” he added. Yan Ping, Chairman of Guangxi Yuchai Machinery Company, said: “We much value the partnership that is aligned with our group strategy of growing international competitiveness. We are committed to delivering optimal quality products for a growing customer base in the Chinese and international markets and looking forward to bringing our partnership to the next level. The components needed to produce the engines at MTU Yuchai Power will initially come from Germany. Suppliers in China capable of delivering parts of the same quality will gradually be added at a later stage. “We will accept no compromises in terms of quality and delivery reliability. It is a responsibility we have towards the MTU brand and our customers,” said Schell.